Often this step takes the longest as it involves creating trust. Move slowly and deliberately. Horse must always have room to get away and reject you. Try not to stand still for very long (this is predatory.) 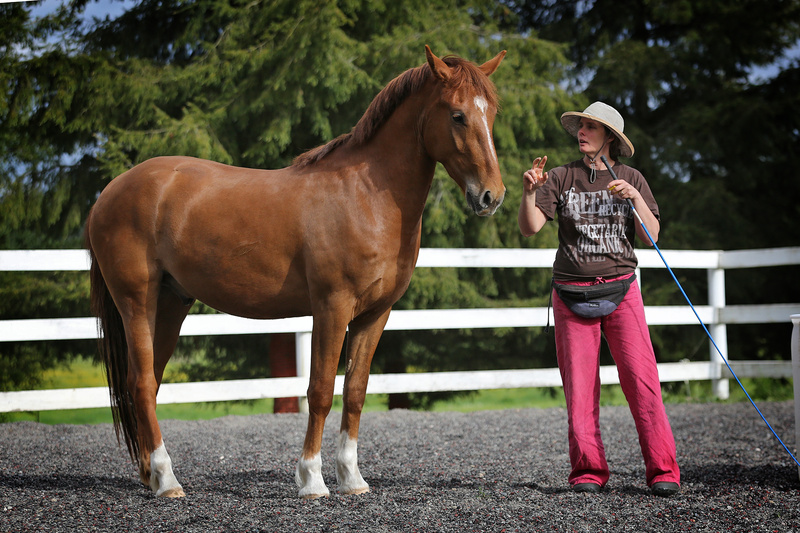 With a fearful horse, act submissive and offer treats, asking very little from the horse at first. With a dominant horse, make sure to protect your space holding your whip in front of you if necessary, make him halt a few feet before treats. Feeding horses treats from a designated training bin will help ensure he does not go after your hand. For a horse you do not know, it is best to just walk nearby, softly looking at the sky or whistling to yourself watching the behavior of the horse. If his muscles tense up and his head rises when you are behind him, retreat to give him room. If you walk away from the horse, he should slowly walk behind you. Horses follow the leader. But there is a confusing distinction between a horse following a lead horse or human and a lead horse pushing a submissive horse. This gets a lot of people in trouble because they misread the horse’s intention. You can tell the difference if you watch body language. A horse following a leader will have his head down, moving slowly and methodically, literally following every step. But a horse trying to dominate will push from behind by hastily nudging or touching the person in front of him. If you think you are leading and your horse thinks he is pushing you, there will be trouble in paradise. He should not be touching you from behind; his demeanor should not be dominant. You can test this easily by stopping from beside or in front of him and judging his opinion. If his ears are softly forward, his nose bent towards you in a curious fashion as he waits patiently, all is well, but if he pushes you, has his ears back, eagerly forcing you to move and mad when you don’t, stomping his feet, snorting or shaking his head, then that is a problem perhaps needing professional help. A horse that is bonded to you will want to be with you whether you are slowly walking or have stopped. If you are in a field together, he may walk a few feet away to eat but he will not venture far. In fact, you can test the bond by walking away to see if he will follow you or be curious or concerned where you are going. His gaze should be soft, ears forward most of the time (especially when you are in front of him) and he should not have any hurried steps, no worried or pushy body language. Once in a while you can stop to eat together, you picking him grass, or stop to scratch his withers or chest; these are both reminders that you are fair and have control over valuable skills that can help him. Some horses, with minimal baggage, will easily sign up to be with you and for others, the scars of bad training will make them fearful of humans. You might sit in a chair in one end of the paddock and read a book, indicating to the horse that you do not expect or demand anything from him. If he stands beside you, things are good and the bond forming. If he avoids you, you might softly walk up to him and give him a treat on the ground then retreating. This will help him create interest in you with no strings attached. Eventually, perhaps, he can take a step or two with you for a cookie from the cookie bar (see resource page) on the other side of the fence. Or he can back up one step. This way you can test whether he sees you as a leader. You can also stand in front of him to make sure his ears are forward as he looks at you, indicating his opinion of you.